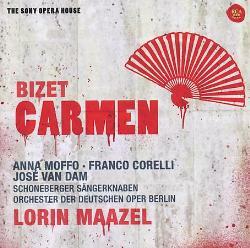 This Carmen seems to be universally despised by critics, but personally, I think most reviews of it are too harsh. It’s a flawed recording, but hardly a total train wreck… I may be biased, though, because it was the first Carmen I ever heard. Yes, Lorin Maazel’s tempos are slightly erratic, sometimes switching in an instant from blood-stirring speed to careful slowness, and yes, the orchestra’s brass-heavy sound is sometimes crude. But the music isn’t distorted. 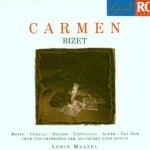 All the charms and passion of Bizet’s creation are still fully in evidence. The Oeser edition of the score is used (this was apparently the first studio recording to use it), which means that we hear a plethora of departures from the standard music, even the almost-never-heard alternate version of the Act III finale. Though oddly, Don José and Escamillo’s duel duet is cut down even further than tradition dictates. Anna Moffo’s Carmen is far from a popular favorite, but as far as I’m concerned she gives a good performance. Her voice may lack its former brightness and freshness, but its fruity, sensuously feminine charm remains, and the smoky darkness of her late-career timbre is ideal for Bizet’s seductive heroine. And as every good Carmen must, she presents a vivid characterization, eternally lively, playful and seductive, yet fierce as a feral cat when crossed. Franco Corelli, also late in his career, gives a quintessential Corelli performance as Don José. His singing is nonstop belting, with no semblance of either French style or subtlety, but still his voice offers ringing, fiery thrills. He and Moffo approach the final scene as verismo-style melodrama, with an onslaught of shouts and snarls: he even eschews the high B-flat on “…démon!” to growl the word instead… then bellows an unwritten high note on “Dam-née!” in a moment of unabashed musical scenery-chewing. Piero Cappuccilli’s Escamillo is likewise a nonstop belter with virtually no subtlety or nuance, but his warm, rich baritone is still an enjoyable sound. Helen Donath, meanwhile, is an angelic Micaela whose sparkling tone is innocence personified in sound, though some people will doubtlessly wish for more power in Act III. The supporting singers, including such luxury casting as José van Dam (Zuniga), Arleen Augér (Frasquita) and Jane Berbié (Mercédes), are strong throughout. The dialogue is spoken by a separate cast of actors, but this hardly matters: it’s also cut to ribbons, with only a few lines between each musical number to move the plot along. This is far from an outstanding Carmen, but it isn’t terrible either. At any rate, it was a perfectly decent introduction to the opera for me. I’d place it about ¾ of the way down on my list of recommendations: not essential, but still worth hearing. Thank you for this helpful and balanced review. I am an unabashed fan of Anna Moffo so I have this recording and dozens more of her. 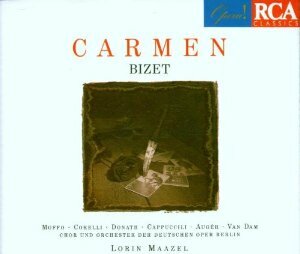 I love “Carmen” and I think she was good as the lead, but I agree, this is certainly not the recording to get over all others. Maazel is a cipher to me. He was quirky in his tempos elsewhere too – as in the recording he made of “Otello” with Placido Domingo and Katia Ricciarelli. Still, that is a powerful video and the leads are great. I also agree that much of this cast is superb and I like Corelli as Don Jose, no matter what. I wish there were not so many cuts but it is a notoriously long opera – considering it’s not Wagner, say.